Gen. Jones, the former Commandant of the Marine Corps, has said that the Marines were created as a landing force for the U.S. Navy, and that the Marines have an “expeditionary mindset”. As Marine commandant, he was also a member of the U.S. Joint Chiefs of Staff. Then, he was named head of the U.S. European Command at NATO’s Brussels headquarters in January 2003. He relinquished command as Supreme Allied Commander in Europe on 7 December 2006, and retired from the Marine Corps on 1 February 2007, ending a 40 year career of active military service. Wikipedia claims that “He also was asked twice by Condoleezza Rice to be Deputy Secretary of State after the resignation of Robert Zoelick. He declined”. The Wikipedia entry for Gen. Jones is here. On 28 November, the famously-predicted “day after” the Annapolis conference that has launched direct Israeli-Palestinian peace negotiations, the U.S. Secretary of State announced that she was appointing Gen. Jones as her “new Special Envoy for Middle East Security“. Rice said:”I look forward to his getting to work as soon as possible”. Unlike the present U.S. advisor in the Israel, Gen. Dayton, who is dealing only with the Palestinians, Gen. Jones is to oversee the work of both Palestinians and Israelis. Rice said: “General Jones will advance our objective of resolving the Israeli-Palestinian conflict. He will work with Israelis and Palestinians on the full range of security issues and he will work to strengthen security for both sides. General Jones will work with Lieutenant General Keith Dayton, who will continue his mission of helping the Palestinian Authority to build and rationalize its security forces. General Jones will also engage with key countries to support Middle East security [n.b., the significance of this is not clear]. He will design and implement a new U.S. Government plan for our security assistance to the Palestinian Authority and our security cooperation with the Israeli and Palestinian governments … It is clear that we will have a superior commander, a seasoned diplomat, a brilliant strategist, experienced leader who understands the security challenges of the Middle East and how to meet those challenges successfully. As we work to help the Palestinians and the Israelis design their future, we hope that the work that General Jones will do will help them to better design a security concept that can make that future one that is clearly one of better security and peace for both sides”. Rice also said that Gen. Jones would “address the regional security challenge comprehensively and at the highest levels”. Is this a reference to Iran??? Gen. Jones said: “I look forward to forming a team and working with both the State Department and Defense Department as the need arises to complete our task”. The full U.S. State Department transcript of this announcement is posted here. Gen. Jones headed the recently-delivered Report of the Independent Commission about Security Forces of Iraq, which can be consulted in its entirety here. On 6 September, the day of the report’s publication, the evidently spruced-up Gen. Jones (better haircut and color, bronzer, and well-cut suits) testified before the Senate Armed Services Committee. The Washington Post has reported that Gen. Jones is highly regarded not only in the military, but also by members of the U.S. Congress. Gen. Jones was born 19 December 1943 in Kansas City, Missouri, and then moved to Europe with his family in 1947, when he was 3 years old — and would have seen some of the how the post-war Marshall Plan worked to rehabilitate European countries devastated by the Second World War. His NATO biography says that Gen. Jones “attended the Georgetown University School of Foreign Service and was commissioned into the Marine Corps in January 1967, served in Vietnam as a platoon and company commander and was promoted to First Lieutenant … General Jones has a Batchelor of Science degree, and an Honorary Doctorate from Georgetown University. His personal decorations include: the Defense Distinguished Service Medal with two oak leaf clusters, Silver Star Medal, Legion of Merit with four gold stars, Bronze Star Medal with Combat ‘V, and the Combat Action Ribbon”. The NATO bio is posted here. Wikipedia reveals that he played basketball at Georgetown University (the team is known as the “Hoyas”, and the school colors were navy blue and grey). He was at Georgetown at the same time as former U.S. President Bill Clinton (who was in the College, not in the School of Foreign Service) — and me (my first year — in the School of Languages and Linguistics, majoring in Arabic, overlapped with Gen. Jones’ last year at Georgetown, and he graduated in June 1966). Another distinguished Alumni from that period was Turki bin Faisal of Saudi Arabia, who was enrolled, like Clinton, in the College. Turki, who was known at Georgetown as “double oh seven” or “007”, a play on the code name for James Bond, who also had a fondness for splashy sports cars, and because of Turki’s grade point average — he attended class faithfully, but had no interest in school at the time. Turki later became Saudi intelligence minister, then Saudi Ambassador to London and then to Washington — resigning recently in a dispute, apparently, with the previous Saudi Ambassador to Washington, Bandar bin Sultan, and others, about the nature of contacts with Israeli officials. Georgetown’s student body, at that time, was composed mainly of the sons and daughters of American professionals (doctors and lawyers), plus about 25% from families of the wealthy and well-connected Latin American oligarchies, and a very few Arab students from newly-independent countries like Kuwait and Libya who were studying English before enrolling in University degree programs. During a time of nation-wide student activism against the U.S. involvement in the war in Viet Nam, Georgetown was a notably quite campus. Just a lonely handful of pacifist students, with one activist clergyman, would maintail a vigil on Fridays at lunchtime just inside the main gate — part of their protest ritual was to eat only a bowl of rice on Fridays, in sympathy with the South-East Asian population. Gen. Jones was introduced by (former NATO Commander) General George Joulwan, at a May 2006 workshop in Berlin on Global Security, sponsored by the Center for Strategic Decision Research, with these words:”[A]s a brigadier general, he [Gen. Jones] was responsible for airlift operations into Sarajevo, relief for the Kurds in northern Iraq, and humanitarian efforts in Africa. He has held command positions at every level in the Marine Corps and served as Legislative Liaison to the Congress, military assistant to the Secretary of Defense, and the Commandant of the Marine Corps. He has been a superb Supreme Allied Commander Europe since January 2003. And he has a great asset for being SACEUR [Supreme Allied Command in Europe] — because he was raised in France and Belgium, he speaks fluent French! Most important, he has both moral courage and respect for political control of the military, but is not afraid to stand up and be counted on difficult issues”. General Joulwan’s description of Gen. Jones is posted here. At the same workshop in Berlin last year, Gen. Jones told other participants that “The term ‘out of area’, which we used not too many years ago, is no longer relevant—not when NATO is involved in Afghanistan, Ethiopia, the Balkans, the Mediterranean, and Iraq. There is no such thing as being out of area in the new NATO because the new NATO has the political will to do more”. He also expressed concern about “the Iranian question and nuclear security”, which, he said, is a matter that affects “our collective security”. Gen. Jones remarks can be seen here. The Palestinian negotiators seem to be happy that the U.S. will arbitrate between them and Israel in this new peace process. This is despite the fact that, so far, the U.S. has been far more sympathetic to Israeli concerns, and has come down on the side of the Israeli negotiators in nearly every dispute to date. On top of that, what will happen if there is disagreement, or obstinancy? What, exactly, will the Arbiter do then? On top of this, one immediate focus is going to be on bolstering the Palestinian Authority’s security services. Interestingly, since the mid-June Hamas ouster of Fatah from Gaza, and Palestinian President Mahmoud Abbas’ formation of a new Palestinian “Emergency Government” — which has been prolonged by decree — Fatah has been sidelined from the PA almost (almost) s neatly as Hamas. Palestinian demonstrations against the Annapolis were banned. Palestinians who tried to demonstrate anyway were brutally repressed, one apparently unarmed demonstrator was shot in the chest in Hebron when the crowd began to throw stones, journalists were severely beaten, tear gas was used to disperse the crowds, and dozens of demonstrators were detained. The PA will have to be very careful from now on about how wisely it trains, disciplines, and deploys its security force(s). Otherwise, the PA — and the role of the American arbiter — could be at risk. So, with all this, will Gen. Jones be keeping his day jobs? On 26 June 2007, Gen. Jones was elected as the 11th member of the Boeing Corporation’s board of directors. A few months earlier, on 5 March, he was named as President and CEO of the newly-created Institute for 21st Century Energy, which is described as an affiliate of the U.S. Chamber of Commerce in Washington D.C. The Institute for 21st Century Energy was then officially launched on 12 June — and the impression is given that this Institute of the U.S. Chamber of Commerce may have been created specially for Gen. Jones. At the launch event, Gen. Jones told those present that “as Commander of NATO, I worried early in the mornings about how to protect energy facilities and supply chain routes as far away as Africa, the Persian Gulf, and Caspian Sea”. Gen. Jones full remarks at the launch event are here. At the Institute for 21st Century Energy, interestingly, Gen. Jones met UNSG BAN Ki-Moon, who has appropriated the issue of climate change as one of the main themes during his UN term of office. BAN visited Gen. Jones in the Institute’s offices in Washington D.C. on 11 October. The Institute for 21st Century Energy says, on its website, that its purpose “is to unify energy stakeholders and policymakers behind a common strategy to ensure that America’s supply of fuel and power is adequate, stable, and affordable, while protecting national security, and improving the environment”. Two of its main goals are also listed: “Protect our national security through the expansion of domestic energy production, while safeguarding our energy assets at home and across the globe”, and “Preserve and improve the environment through greater efficiency, technology-based solutions, and the sound management of global climate change”. The Institute’s Mission statement can be found on the Institute’s website here. A key indication that Gen. Jones is making an effort to glossily groom his post-military career is that he is now being represented by the Leading Authorites speakers and talent bureau. Their website indicates that Gen. Jones is available to speak for a fee in the $20,001-$50,000 per event range, depending (in part) on location. The Leading Authorities website says that Gen. Jones “may be the most sought-after man in politics today. The top presidential candidates from both major parties are actively courting Jones for his wisdom, guidance, and endorsement … General James L. Jones – sought-after by, and distinguished among, politicians of every stripe – offers a vast wealth of knowledge, and speaks with poise and authority about international politics, energy, and leadership in the 21st century”. Gen. Jones may have even more to talk about after his assignment as Annapolis Arbiter. In a surprising and significant step, Fatah has issued a statement criticizing the Palestinian Authority’s ban on demonstrations protesting the Annapolis Conference, and the Palestinian security force’s attacks on demonstrators and on journalists at a number of demonstrations throughout the West Bank. Predictably, however, the Fatah statement blamed Hamas, according to the report by the Ma’an news agency. Maan wrote that “Fatah expressed its concern on Wednesday over the future of Palestinian democracy as a result of the Palestinian Authority banning rallies and gatherings, both pro and anti Palestinian president Mahmoud Abbas and the conference. In a press release, they reiterated their support for Abbas and the Palestinian negotiation team, saying they hold Hamas responsible for the escalating political tensions in the Palestinian territories. However, they said they considered the decision to ban rallies and gatherings to be an unprecedented and dangerous violation of freedom of expression. They also condemned the assaults on journalists and demonstrators, perpetrated by Palestinian security services during anti-Annapolis rallies in a number of cities on Tuesday.” The Maan report on Fatah’s statement is published here. The Vatican, interestingly, managed to wrangle an invitiation to participate in the just-concluded Annapolis Conference convened by U.S. Secretary of State Condoleeza Rice and U.S. President George Bush. The Vatican — the government of the Roman Catholic Church — which has its seat in the territorially and administratively independent Holy See based in the Vatican City in Italy, has long been asserting its interests in participating in the solution to the Israeli-Palestinian conflict. The Vatican also has an on-going dispute with the Israeli Government on the issue of Israeli taxation of religious institutions in the region. The day after the Annapolis conference, the Associated Press reported that “A Vatican official said Wednesday that Palestinian refugees have the right to return to their homeland, and said he hoped Israeli-Palestinian peace talks would address the issue. Cardinal Renato Martino, who heads the Vatican’s office for migrants, said an agreement to restart peace talks, reached Tuesday in Annapolis, Maryland, was encouraging and that he hoped by this time next year concrete measures would be under way. ‘It is my hope that all the parts of the problem are taken into consideration such as that of the Palestinian refugees, who like all other refugees, have the right to return to their homeland’, Martino said … Martino spoke at a news conference to launch Pope Benedict XVI’s annual message for the World Day of Migrants and Refugees, which the Catholic Church marks on January 13″… The Cardinal’s remarks were published by The Jerusalem Post here. So, how was “The Day After”, that U.S. Secretary of State Condoleeza Rice famously said Israeli and Palestinian negotiators must prepare so assiduously for? The Jerusalem and Washington correspondents of the McClatchy newspaper group wrote that “The Wednesday morning newspapers trumpeting the latest fresh start toward peace between Israelis and Palestinians hadn’t hit American doorsteps when the first crude Qassam rocket of the day soared out of the Gaza Strip and into southern Israel. Before lunch, Palestinian Authority police in the West Bank were using truncheons to break up angry mourners trying to bury a demonstrator who was killed a day earlier while protesting the new peace initiative. By the time Israeli Prime Minister Ehud Olmert and Palestinian Authority President Mahmoud Abbas joined President Bush in the Rose Garden to launch the latest round of negotiations, an Israeli airstrike had killed two naval police officers in the Gaza Strip, where the militant Islamist group Hamas seized military control in June after winning U.S.-backed elections in January…” The McClatchy newspapers report is here. The Associated Press’ Bureau Chief for Israel and the Palestinian territories had these reflections on the complicated implications for future negotiations: “If Israelis and Palestinians have any hope of achieving their stated goal of signing a final peace treaty within a year, they may have to slice Jerusalem in half with a wall, come up with $85 billion for Palestinian refugees and figure out how to wrest control of the Gaza Strip from Hamas. They’ll also have to agree on which territory Israel should give to a future Palestine in exchange for being allowed to keep major settlement blocs in the West Bank. And if they decide not to divide Jerusalem, they’ll have to determine how to share it while avoiding the potential security nightmare of an open border … The Palestinians want to establish an independent state in the West Bank, Gaza Strip and east Jerusalem — areas that Israel captured in the 1967 Mideast war. Of all the obstacles to a peace deal, none looms larger than Jerusalem — the city at the heart of the Israeli-Palestinian conflict, with its holy sites of such enormous importance to Muslims, Jews and Christians. [n.b., others believe that the Palestinian refugee question, which Steve mentions later in his piece, is a much bigger problem…] Past peace negotiations have made it clear that the city will have to serve as the capital of both Israel and a future Palestine. But that raises more questions than it answers. How can you transfer east Jerusalem to Palestinian sovereignty without stripping its residents of Israeli social security benefits, for instance, or how can Israelis and Palestinians each have access to the city but not the other’s country? [n.b., this is an Israeli concern, not a Palestinian one] Most Israelis and Palestinians do not want to divide the city, like the way it was before Israel captured its eastern sector in 1967. However, security concerns may require just that — unless the sides can come up with an alternative such as erecting checkpoints at all roads leading out of Jerusalem to keep Palestinian militants from entering Israeli cities. But there’s an even thornier issue — how to share the emotionally charged Jerusalem holy site known to Muslims as the Noble Sanctuary and to Jews as the Temple Mount. As the site contains a Muslim shrine built on the remains of a Jewish one, a solution will almost certainly require an international presence to administer jurisdiction…” The AP piece is here. This resolution was adopted by a vote in the UN General Assembly on 29 November 1947. It partitioned the British mandate of Palestine into two states — one Jewish and one Arab — with Jerusalem having a special international status. UN General Assembly Resolution 181 of 29 Novemer 1947 is cited as a basis for the establishment of the State of Israel in the Proclamation of that state made from Tel Aviv on the night of 14 May 1948, as British forces withdrew. It is also cited in the 15 November 1988 Palestinian declaration of a state, and of independence, made by Yasser Arafat at a meeting of the PLO’s Palestine National Council (in exile) in Algiers — by which the most recognized and most legal Palestinian body can be said to have thereby recognized Israel as a Jewish state. This UN GA resolution requests the UN Security Council to “take the necessary measures as provided for in the plan for its implementation”. Like the Palestine Mandate assigned to Britain to administer and set up by the League of Nations — the predecessor body to the United Nations — this resolution specifically authorized Jewish immigration: “The mandatory Power shall use its best endeavours to ensure than an area situated in the territory of the Jewish State, including a seaport and hinterland adequate to provide facilities for a substantial immigration, shall be evacuated at the earliest possible date and in any event not later than 1 February 1948”. This resolution also determines that “Independent Arab and Jewish States and the Special International Regime for the City of Jerusalem, set forth in part III of this plan, shall come into existence in Palestine two months after the evacuation of the armed forces of the mandatory Power has been completed but in any case not later than 1 October 1948. The boundaries of the Arab State, the Jewish State, and the City of Jerusalem shall be as described … below”. The full text of UN GA Resolution 181 resolution can be found on the UN website here. Ian Williams has written an interesting piece on Resolution 181 which is published in the Comment is Free section of The Guardian’s website. In his piece, dear Ian writes: “The resulting map broke many existing principles – not least of cartography. It produced a checkerboard state, without consulting the occupants directly. So, for example, the Jewish state held barely a majority of Jews and thus incorporated, presumably against their will, 400,000 Palestinian Arabs. Jerusalem, in a decision worthy of the setting for Pontius Pilate’s famous manual ablutions, was to belong to neither. It was to become a “corpus separatum” under UN direction – which is why today, except for a few banana republics, no country in the world, not even the US, will build an embassy there, or recognise it as Israel‘s capital, eternal or otherwise. Indeed, it is a telling argument against Palestinian claims to the city as its capital – but for obvious reasons it is not one that Israel and its supporters are likely to make. The resolution passed in the general assembly, but in the modern age, any such crucial decision would now go to the security council, where the US can wield its veto. Indeed, Israel and the US now argue that general assembly resolutions are not binding. This is something of an anomaly for a state whose raison d’etre is based on historical claims, since if general assembly resolutions are not binding, then the creation of Israel as a Jewish state was not binding on the Arabs. The resolution does in fact say that any breach by any party is a threat to peace and security to be dealt with by the security council – which is of course still ‘dealing with it 60 years later. On the contrary, of course, Palestine‘s supporters have somersaulted in the opposite direction and argue that general assembly resolutions are binding – but tend to overlook Resolution 181, which the Arab states in the UN at the time disregarded. It was certainly unjust in terms of self-determination, but legal. David Ben-Gurion and Israel’s founding fathers took a lot of flack from their diehard supporters for accepting partition but deflected it by pointing out quietly that they had no intention of restricting themselves to those boundaries – which in truth made little sense in any topographic, ethnographic or any manner. The partition would not be final, Ben-Gurion said, not with regard to the regime, not with regard to borders and not with regard to international agreements’. While Resolution 181 may seem anachronistic, its drafters presciently realised the Heath Robinson/Rube Goldberg nature of the boundaries, and drew up plans for an economic and customs union with free transit, which would almost make a two-state solution feasible. It allowed people to reside in one state while holding citizenship of the other, which points to solutions to populations left behind any new boundaries established. Maybe it is the time for Palestinian president Mahmoud Abbas to draw a line on the road map between the initial resolution and the final status. He should apologise for the failure of the Arab states to accept Resolution 181 and its determination that there should be a Jewish state. But he should use the resolution’s map as the starting point for negotiations to get back to the 1967 armistice line rather than start at the latter and negotiate backward to the separation wall”. Ian’s thoughts on Resolution 181 are here. 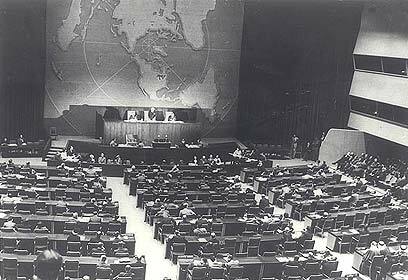 The doctrine, or the right, of self-determination had not been developed in 1947, when this UN General Assembly partition resolution was adopted by a (divided) vote. The doctrine — or the right — of self-determination was developed within the UN starting only in the 1960s. And, international law experts say that the moment the Palestine National Council declared the Palestinian state in November 1988 — specifically, only in the Palestinian territory seized by Israel in the June 1967 war — the Palestinians gave up their claim to the land assigned to the “Arab” state in Resolution 181. But, these international law experts maintain, the Palestinians do have clear and uncontested legal title to that Palestinian territory seized in 1967 — to all of it, to all of the West Bank, to East Jerusalem, and to the Gaza Strip. The Palestinians are not required to negotiate their title to this territory, it is theirs. The Israeli media is reporting that Israeli Prime Minister Ehud Olmert and Palestinian President Mahmoud Abbas have been called to the White House later Wednesday for some kind of formal or “ceremonial” launch of the agreed direct negotiations. Haaretz reports that “U.S. President George W. Bush invited the pair to the White House to ceremonially inaugurate the first formal, direct negotiations in seven years. Bush planned to meet separately with Palestinian President Mahmoud Abbas on Wednesday, then Prime Minister Ehud Olmert and finally to get them together for an afternoon session and declaring the talks formally under way. Israel and the Palestinians will begin final-status negotiations on December 12 … Both sides agreed that Washington will determine whether those obligations have been fulfilled. Bush has chosen General Jim Jones, a former commander of both NATO and the American forces in Europe, to serve as the arbiter, and Jones is due to arrive in the region in the coming days“… The Haaretz report of the formal launch of direct negotiations later today is here. This same Haaretz story reports that “Foreign Minister Tzipi Livni urged the Arab states to ‘get off the fence’ and understand that normalization is not a prize for Israel. She proposed normalization in stages. Addressing the Palestinians, she urged them to stop mourning Israel’s establishment and instead build a state of their own“. In an interesting behind-the-scenes story, Haaretz reports separately that “The joint Israeli-Palestinian declaration issued at Annapolis Tuesday was completed less than half an hour beforehand, Israeli and Palestinian sources told Haaretz. According to the Palestinian sources, yet another round of Israeli-Palestinian talks on the document broke off at midnight on Monday with no results. At that point, Saeb Erekat replaced Ahmed Qureia, the head of the Palestinian negotiating team, and the talks resumed, but still no progress was made. The next morning, after the parties already had landed in Annapolis, the talks continued. Finally, U.S. Secretary of State Condoleezza Rice took Palestinian President Mahmoud Abbas out of a three-way meeting with U.S. President George Bush and Prime Minister Ehud Olmert and pressured him to approve the draft document, the sources said. Eventually, he did so, enabling Bush to read it to the conference. The Israeli sources noted that Bush was clearly pushing for the document: At his three-way meeting with Abbas and Olmert Tuesday morning, they said, the first words out of his mouth were, ‘What’s happening with the joint declaration?’ But the Israelis had a different version of what had happened: They said the Monday night talks with Erekat produced several agreements, but the next morning, the Palestinians changed their mind. That, said the Israelis, already had happened several times during talks on the declaration, but they were shocked that the Palestinians were doing it again at this late date and on such fundamental issues as a timetable for negotiations and reference to the road map peace plan. Foreign Minister Tzipi Livni, who headed the Israeli team, lost her temper and told Qureia to ‘take it or get lost’, the sources said. As the difficulties mounted, there were also fierce arguments within the Israeli team: Livni very much wanted a joint declaration, but some members of the team said it was ‘a waste of time’, and suggested she forget about it. Olmert, however, sided with Livni, and the Americans’ determination tipped the scales…” A Haaretz report on last-minute manoeuvers is here. This photo taken by a Reuters News Agency photographer yesterday in the Khan Younis refugee camp in the southern Gaza strip, showing Palestinians watching the televised Annapolis conference proceedings, indicates that the indifference is not as great as some have reported. The photo also reminds me of an amazing finding in a Palestinian poll, published about a month ago, showing that some 82 percent of those Palestinians in Gaza who were questioned said that they felt safe inside their homes — though their situation could hardly be more precarious. The view from Annapolis was somewhat different – Mahmoud Abbas said it was a “charming” place, in his remarks to the conference. The Jerusalem Post reported, after the Annapolis conference, that Nabil Amr, a top advisor to Palestinian President Mahmoud Abbas (and previously to Yasser Arafat) said: ” ‘I feel that the real battle has begun now …The hard talks are still awaiting us. We must look seriously at the next phase’. Amr said he was encouraged by the growing involvement of the Americans and Europeans in the peace process. He also said that any agreement reached with Israel would be presented to the Palestinians through a national referendum. ‘The Palestinians will be asked to approve any agreement’, he added. ‘Palestinians living outside the West Bank and Gaza Strip will also have the right to vote. If our people reject the agreement, we will cancel it. If they approve it, we will move forward with it’.” The comments from Nabil Amr in the Jerusalem Post are here. This is interesting — it is not clear who, or which of the Palestinians, Amr thinks should be asked for their approval — or not. Would this include those Palestinian refugees still living in UNRWA-run camps in neighboring Jordan, Syria and Lebanon? Would it include Palestinians living in the “diaspora” outside of UNRWA’s area of operations? Would it include Palestinian residents of East Jerusalem? Or would it be just those Palestinians currently living under Israeli occupation in the West Bank and Gaza? In any case, it is just slightly bizarre and unreal to speak about asking Palestinians to approve, or not, in some kind of referendum, any peace deal reached with Israelis, at the same time that Palestinian security forces are forcefully, if not brutally, repressing expressions of anti-Annapolis sentiment in the West Bank. (At the moment, the expression of such sentiments is being encouraged in Hamas-run Gaza.) One 36- or 37-year-old apparently unarmed Palestinian man was killed by Palestinian security forces at an apparently non-violent demonstration in Hebron on Tuesday afternoon, and other demonstrators were injured. Tear gas and other forceful means of crowd control were used to disperse an apparently non-violent anti-Annapolis rally in Ramallah. Israel’s Ynet news correspondent Ali Waked reported from Ramallah that “The hot topic at the dinner table at the house where I was hosted in Ramallah didn’t concern the goings-on in Maryland. Rather, the central matter of discussion was if it was proper to suppress anti-Annapolis demonstrations, which resulted in dozens of injuries and even the death of one Palestinian protester. The Ramallah residents wondered whether Palestinians should kill each other for the benefit of a photo shoot meant to serve US interests”. The Ynet report from Ramallah is here. One of the minor but interesting details about these rallies is the different political coloration that has variously been ascribed to the demonstrators: Ynet’s Ali Waked reported that “Palestinian police forces operating in the West Bank city of Ramallah, stopped a Popular Front for the Liberation of Palestine (PFLP) protest against the peace summit. According to reports, police blocked the roads leading to Ramallah’s Manara Square, preventing some 400 people from reaching it. A Palestinian source told Ynet that Palestinian police decided to prevent the rally after receiving information indicating that Hamas intended to incite a local riot. The PFLP – under orders form its Damascus headquarters – decided public safety and public order outweighed the need for the protestors to speak their mind, added the source, prompting them to call the rally off”. The Ynet report that the PFLP called the march that PA security in the West Bank said was infiltrated by Hamas is here. The Jerusalem Post reported slightly different information concerning who was behind the protest demonstrations: “Tuesday’s protests in the West Bank, the largest since Hamas’s violent takeover of the Gaza Strip last June, came despite a ban imposed by the PA leadership on anti-Annapolis demonstrations. One Palestinian, Hisham al-Baradi, 37, was killed and dozens injured during clashes between the demonstrators and security forces loyal to Mahmoud Abbas. Several journalists covering the protests were beaten by PA policemen. The PA security commander of Hebron, Gen. Sameeh al-Saifi, was injured in the face by a stone. The demonstrations in Ramallah, Hebron, Nablus and Tulkarm were organized by Hamas and another radical Islamic group called Hizb al-Tahrir”. The JPost report on the Palestinian anti-Annapolis protests is posted here. Other Palestinian demonstrations were also suppressed in the West Bank cities of Bethlehem and Nablus, the Palestinian news agency Ma’an reported. And, the editor of the Jerusalem Post, David Horovitz, wrote in today’s paper that “Only now, after Annapolis, does the genuine work begin. Olmert made a notably magnanimous speech here, parts of which will infuriate his many critics on the political right, declaring that ‘I have no doubt that the reality created in our region in 1967 will change significantly’. Israeli leaders down the decades have rightly blamed the Palestinian leadership and the wider Arab world for the ongoing plight of Palestinian refugees and their descendants in blighted refugee camps. But Olmert, strikingly, empathized with their suffering – their ‘wallowing in poverty, neglect, alienation, bitterness and a deep, unrelenting sense of deprivation’. He even said he knew that this ‘pain and deprivation is one of the deepest foundations which fomented the ethos of hatred towards us’. This is a remarkable statement, and certainly comes closer than any other mainstream Israeli leader has ever moved toward showing understanding, though not justification, for the Palestinian argument about the roots of terrorism. Abbas’s speech was more resonant, more effectively structured, but markedly less empathetic in its thrust. On previous such occasions – and the history of failed peacemaking is littered with them – he has spoken movingly of Jewish suffering through the ages. Here, he was careful to specify all the Arab wrongs that needed addressing, including ‘ending the occupation in all the Palestinian territories occupied in 1967, including east Jerusalem, as well as the Golan Heights and parts of Lebanon’, and resolving ‘the plight of Palestinian refugees, which must be addressed holistically – that is, in its political, human and individual dimensions in accordance with UNGA resolution 194, as emphasized in the Arab Peace Initiative’.” The JPost post-Annapolis analyis is here. Daniel Levy’s comment in The Guardian is here. Here is our pick for the most far-reaching and consequential decision at the Annapolis conference today: the two sides have apparently agreed that the U.S. will be the prosecutor, judge, and jury of their acts and deeds from now on, until further notice.